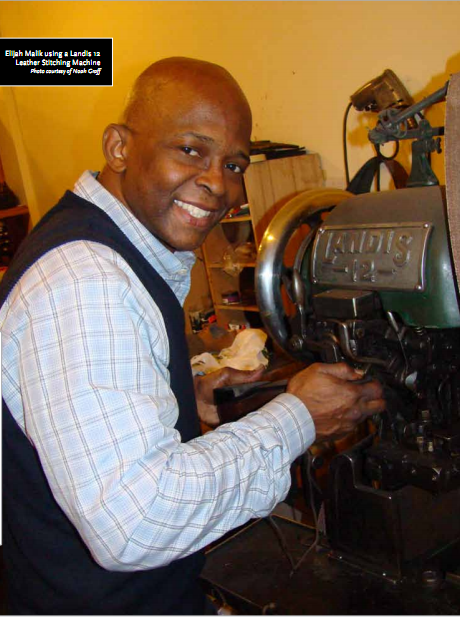 Elijah Malik, has been in the shoe repair business since 2003. Four years ago he opened his shop, Your Shoe Repair, a full service shoe repair shop in Chicago’s hip northwest-side neighborhood of Wicker Park. His services include fixing buckles and rips in leather, replacing soles and heels, waterproofing, conditioning, dying, and shoe shines. EM: Initially, it was mostly business people. You could count on them to keep their shoes shined and their heels looking good. But now it’s become more across the board because of the economy. People who would have normally bought some Payless Shoes and then chucked them are deciding to fix their shoes. And, I’d say 85 percent of my clientele are women. Even though I might get a higher portion of men’s shoes, the women are bringing them in. What’s the most typical repair you do, and what is your biggest challenge? The most common repairs are heels and shines, shines are considered a repair. Our toughest challenge is customers who have unrealistic time expectations. Some people don’t have a good understanding of what’s really taking place for the repair. What’s one of the most interesting repair jobs you’ve had? I had some boots come in that a dog had eaten up horribly. The customer came in with tears in her eyes but when she left she was all smiles. She couldn’t believe the shoe could be restored like that. To me that was special, to be able to touch a customer who really valued the service.